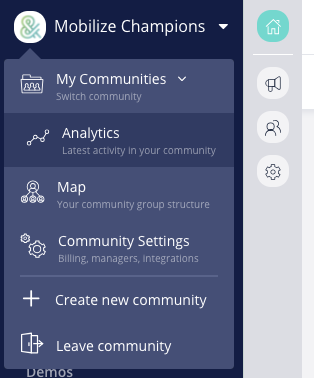 Advanced Analytics tell you more about how your overall community is engaging. When we refer to an active member or group, it is calculated by the total number of activities that happened in the group or by that person. Activities include views, clicks, posts, and anything else you can do in Mobilize. As a Community Manager (with community admin rights), you can find your Analytics from the menu in the top left corner of your screen. In addition, you can always see analytics on every post you create in the free and paid versions of Mobilize. Do you offer group and member analytics? We do not yet offer analytics at the group or member level in Mobilize. You do have the ability to see the activity history of each member in their profile as a manager, and you can also see member subscriptions to Lounge and Manager Emails in the Member Database of that group.